Leah Hogsten | The Salt Lake Tribune Rigger Devin Barnes with Ironworkers Local 27 places the last beam on the north concourse building. The Salt Lake International Airport redevelopment program celebrated another major milestone Tuesday as the last steel beam was raised on top of the north concourse. The topping off ceremony March 19, 2019 on the north concourse was similar to one that took place in May 2018 on the airport's central terminal. The practice of topping off is a Scandinavian religious rite of placing a tree atop a new building to appease the tree-dwelling spirits dispaced during construction. Leah Hogsten | The Salt Lake Tribune The Salt Lake International Airport redevelopment program celebrated another major milestone Tuesday as the last steel beam was raised on top of the north concourse. The topping off ceremony March 19, 2019 on the north concourse was similar to one that took place in May 2018 on the airport's central terminal. The practice of topping off is a Scandinavian religious rite of placing a tree atop a new building to appease the tree-dwelling spirits dispaced during construction. Leah Hogsten | The Salt Lake Tribune l-r Riggers Devin Barnes and Dustin Steele with Ironworkers Local 27 prepare to place the last beam on the north concourse building. The Salt Lake International Airport redevelopment program celebrated another major milestone Tuesday as the last steel beam was raised on top of the north concourse. The topping off ceremony March 19, 2019 on the north concourse was similar to one that took place in May 2018 on the airport's central terminal. The practice of topping off is a Scandinavian religious rite of placing a tree atop a new building to appease the tree-dwelling spirits dispaced during construction. Leah Hogsten | The Salt Lake Tribune The Salt Lake International Airport redevelopment program celebrated another major milestone Tuesday as the last steel beam was raised on top of the north concourse. The topping off ceremony March 19, 2019 on the north concourse was similar to one that took place in May 2018 on the airport's central terminal. The practice of topping off is a Scandinavian religious rite of placing a tree atop a new building to appease the tree-dwelling spirits dispaced during construction. Leah Hogsten | The Salt Lake Tribune Airport Senior Planner Raymond Christy signs the remaining beam on the north concourse prior to the topping off beam placement. The Salt Lake International Airport redevelopment program celebrated another major milestone Tuesday as the last steel beam was raised on top of the north concourse. The topping off ceremony March 19, 2019 on the north concourse was similar to one that took place in May 2018 on the airport's central terminal. The practice of topping off is a Scandinavian religious rite of placing a tree atop a new building to appease the tree-dwelling spirits dispaced during construction. 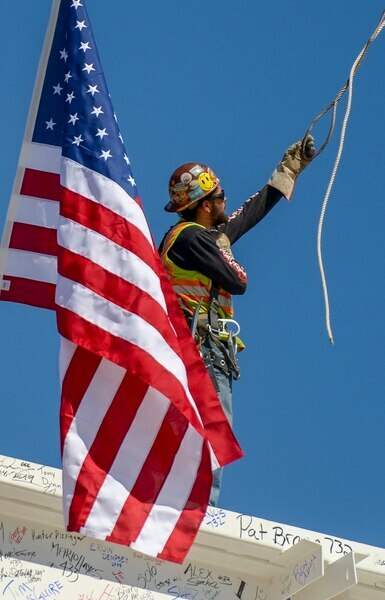 Leah Hogsten | The Salt Lake Tribune Rigger Heath Hoskins with Ironworkers Local 27 rigs the last beam prior to placement. The Salt Lake International Airport redevelopment program celebrated another major milestone Tuesday as the last steel beam was raised on top of the north concourse. The topping off ceremony March 19, 2019 on the north concourse was similar to one that took place in May 2018 on the airport's central terminal. The practice of topping off is a Scandinavian religious rite of placing a tree atop a new building to appease the tree-dwelling spirits dispaced during construction. Leah Hogsten | The Salt Lake Tribune l-r Raising gang forman Kraig Iverson and rigger Samiu Loomu with Ironworkers Local 27 celebrate the placement of the last beam on the north concourse building with a hug. 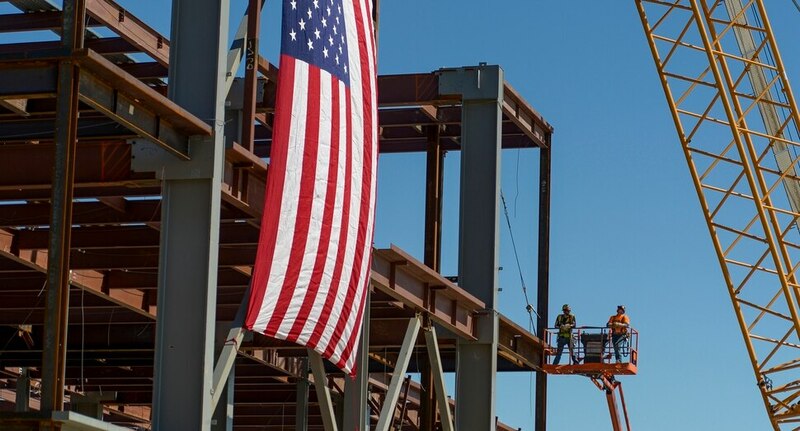 The Salt Lake International Airport redevelopment program celebrated another major milestone Tuesday as the last steel beam was raised on top of the north concourse. The topping off ceremony March 19, 2019 on the north concourse was similar to one that took place in May 2018 on the airport's central terminal. The practice of topping off is a Scandinavian religious rite of placing a tree atop a new building to appease the tree-dwelling spirits dispaced during construction. Leah Hogsten | The Salt Lake Tribune l-r Riggers Devin Barnes and Dustin Steele with Ironworkers Local 27 prepare to place the last beam on the north concourse building. The Salt Lake International Airport redevelopment program celebrated another major milestone Tuesday as the last steel beam was raised on top of the north concourse. The topping off ceremony March 19, 2019 on the north concourse was similar to one that took place in May 2018 on the airport's central terminal. The practice of topping off is a Scandinavian religious rite of placing a tree atop a new building to appease the tree-dwelling spirits dispaced during construction. Leah Hogsten | The Salt Lake Tribune l-r Riggers Devin Barnes and Dustin Steele with Ironworkers Local 27 shake hands after placing the last beam on the north concourse building. The Salt Lake International Airport redevelopment program celebrated another major milestone Tuesday as the last steel beam was raised on top of the north concourse. The topping off ceremony March 19, 2019 on the north concourse was similar to one that took place in May 2018 on the airport's central terminal. The practice of topping off is a Scandinavian religious rite of placing a tree atop a new building to appease the tree-dwelling spirits dispaced during construction. Leah Hogsten | The Salt Lake Tribune l-r Raising gang forman Kraig Iverson and rigger Heath Hoskins with Ironworkers Local 27 celebrate the placement of the last beam on the north concourse building. The Salt Lake International Airport redevelopment program celebrated another major milestone Tuesday as the last steel beam was raised on top of the north concourse. The topping off ceremony March 19, 2019 on the north concourse was similar to one that took place in May 2018 on the airport's central terminal. The practice of topping off is a Scandinavian religious rite of placing a tree atop a new building to appease the tree-dwelling spirits dispaced during construction. Leah Hogsten | The Salt Lake Tribune The Salt Lake International Airport redevelopment program celebrated another major milestone Tuesday as the last steel beam was raised on top of the north concourse. The topping off ceremony March 19, 2019 on the north concourse was similar to one that took place in May 2018 on the airport's central terminal. The practice of topping off is a Scandinavian religious rite of placing a tree atop a new building to appease the tree-dwelling spirits dispaced during construction. Leah Hogsten | The Salt Lake Tribune The Salt Lake International Airport redevelopment program celebrated another major milestone Tuesday as the last steel beam was raised on top of the north concourse. The topping off ceremony March 19, 2019 on the north concourse was similar to one that took place in May 2018 on the airport's central terminal. The practice of topping off is a Scandinavian religious rite of placing a tree atop a new building to appease the tree-dwelling spirits dispaced during construction. Leah Hogsten | The Salt Lake Tribune The Salt Lake International Airport redevelopment program celebrated another major milestone Tuesday as the last steel beam was raised on top of the north concourse. The topping off ceremony March 19, 2019 on the north concourse was similar to one that took place in May 2018 on the airport's central terminal. The practice of topping off is a Scandinavian religious rite of placing a tree atop a new building to appease the tree-dwelling spirits dispaced during construction. The final steel beam placed atop the under-construction North Concourse was celebrated Tuesday as another milestone in progress of the the Salt Lake City International Airport expansion. This so-called “topping off” ceremony was similar to one last May on the new airport’s central terminal. 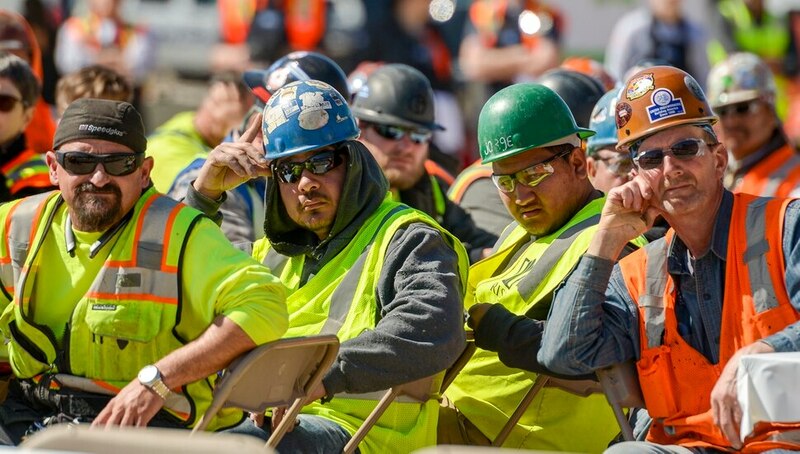 Construction workers listened to remarks by Salt Lake City Council Chairman Charlie Luke; Patrick Leary, chief of staff to Mayor Jackie Biskupski; Department of Airports Executive Director Bill Wyatt and Brett Okland, president of Okland Construction. The practice of “topping off” is a Scandinavian religious rite of placing a tree atop a new building to appease the tree-dwelling spirits displaced during construction. The groundbreaking for the $850 million North Concourse was held in January 2018, and since that time workers have poured approximately 16,190 cubic yards of concrete and erected more than 5,000 tons of structural steel. Phase 1 of the project will include 20 gates in a 465,775-square-foot building. The second phase will include 10 gates in a 364,479-square-foot building with the ability to build an additional 15 gates.